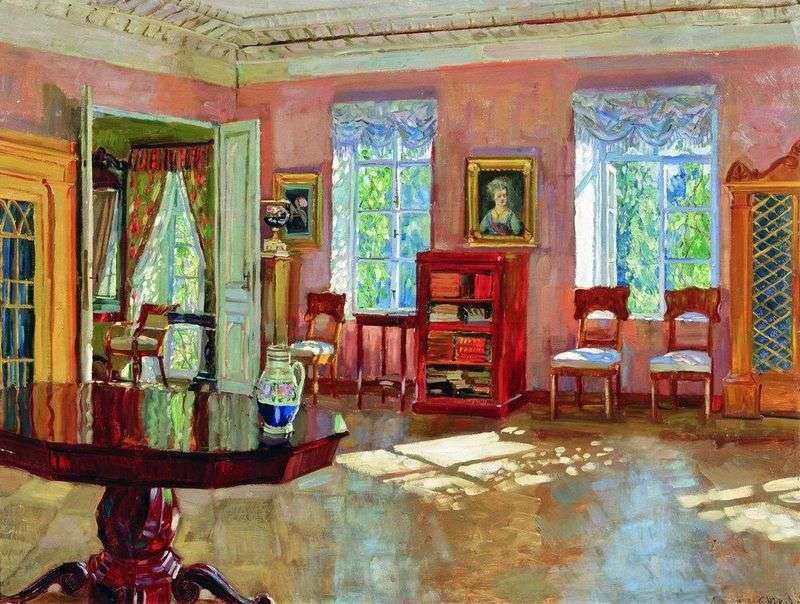 In his painting “Interior of the library of the landlord’s house” Zhukovsky S. Yu depicts a richly furnished room. In the interior of this library a lot of interesting, attention-grabbing details. Looking at the picture, it seems that you are in a museum. This feeling is promoted by a variety of colors and shades, which the author, without regret generously applied to the canvas. Cleanliness and perfect order are everywhere. In the foreground we see a smooth shiny lacquered table made of wood. Coloring it adds a massive carved leg. Its surface very naturally reflects the surrounding furniture, curtains and green foliage outside the window. On the table stands a painted pitcher. There are not a speck of dust on the table. The window light falls on the cleanly washed, reflecting the shadows from the frame. On the walls hang paintings in gilded thick frames. A large portrait of an important person stands out clearly. Near the open windows are conveniently located soft chairs, sitting on which you can delve into the reading. There, near the window is a chest of drawers, filled with several volumes of encyclopedias and reference books. In addition, there is a small table near the chair, so it was convenient to put books on it. The room has two closets, in which books are stored. The vase standing in the corner behind the door unobtrusively speaks of the high status of the hosts. In the room, the doors are ajar, and we see a part of the second room. It has a long window to the floor and a wooden armchair. Salad red curtains serve as an excellent addition to the green foliage behind the window. There is not a single extra detail in the picture. All elements of the interior are very clearly and harmoniously combined with each other. It is evident that the attentive owners of furniture carefully selected. All items are strictly in their places, which indicates the accuracy and frugality of legitimate users of the library. Description and meaning of the painting The interior of the library of the landlord’s house by Stanislav Zhukovsky.